Dan Morgan Lee has been around wine since the '70s, made his own since the '80s and grown grapes since the '90s. His Double L Ranch in the Santa Lucia Highlands is lauded for the quality of its fruit. Sam Smith is the winemaker for Morgan Winery, and he carries out the minimalist vision that produces what they call wines of "balance, elegance and distinction." The grapes for the 2015 Metallico were taken from several cool Monterey County sites: the Roger Rose, Leavens, Double L, and Kristy’s estates. It's unoaked, so they use the most fruit-forward vineyard blocks. The wine was whole cluster pressed, aged for five months in stainless steel, underwent no malolactic fermentation. The alcohol sits at a very manageable 13.5% abv and it sells for $22. 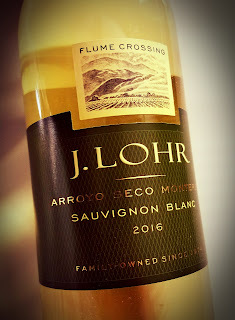 This is a lovely, savory Chardonnay, the kind that makes me sorry I usually pass up the grape on restaurant lists and in the wine shop in favor of something a bit more exotic. This is plenty exotic. Slightly golden in color, the nose brings an earthy salinity to the table. A touch of lanolin masks the Meyer lemon and tropical fruit aromas. The palate also shades the fruit with earthiness and lemon peels. This wine has zippy acidity and is literally made to go with food. I like it as much as some Chardonnays I've tried at twice the price. The Arroyo Seco AVA is centered around Monterey County's Arroyo Seco River, a seasonal waterway that brings rain and snowmelt from the Santa Lucia Mountains to the Salinas River. Commercial grape growing started in 1961 and has grown to some 7,000 acres under vine. The region is about 40 miles away from the deep waters of Monterey Bay and parts of it get direct exposure to the Pacific Ocean through the Salinas Valley, both adding to its cool-climate stature. 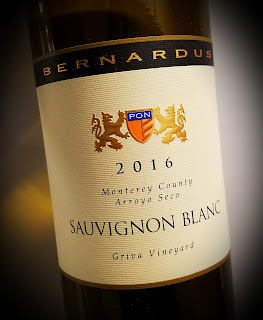 Michael Griva's vineyard - reportedly planted specifically for Carmel Valley's Bernardus - contains Sauvignon Blanc grapes, the aromatic Musqué clone, and a small section of Sémillon grapes. The sandy, stone-laden soil drains very well and provides a great place for the fruit to soak up enough sun to ripen to great varietal expression. It's mainly a Sauvignon Blanc, with the Sémillon providing just a 5% splash. The Bernardus Griva was fermented in steel tanks, then aged several months in large neutral French oak barrels. Alcohol is restrained, at 13.9% abv and the wine retails for $30. This is a beautiful California Sauvignon Blanc. It has a wonderful nose that offers more salinity than grassiness. Citrus and minerals are also in play. On the palate, the savory herbal flavors get the citrus treatment, too. Zippy acidity brings a lively food friendliness, so pair it with shellfish, salads or spinach. 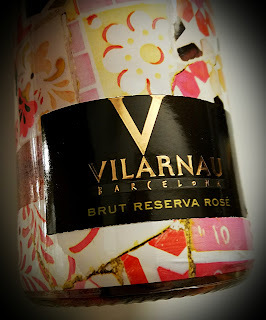 Cava house Vilarnau is located outside Barcelona. I understand they date back to the 1940s, although their parent company goes back much further. Manuel María González Ángel founded his sherry winery in 1835, then joined up with his English agent Robert Blake Byass. Gonzalez Byass continues today under the descendents of Señor González. They sell a large variety of wines, like the cavas of Vilarnau. The bottles are wrapped in the avant-garde design of Antoni Gaudi. Vilarnau Brut Reserva Rosé is a Catalonian, non-vintage DO Cava that provides bubbles and substance at a very fair price. Alcohol sits at only 12% abv, and the sticker price is only $16. The wine is made from 85% Trepat grapes and 15% Pinot Noir. The Pinot was grown in the Penédes region of Catalonia, while the Trepat grapes came from Conca de Barberà in Tarragona. That red grape is probably indigenous to northeast Spain, and used mostly for making rosé wines. The color is extracted from the grape skins for 18 hours, and fermentation takes place in steel tanks, while the secondary fermentation - from whence the bubbles come - happens in the bottle. This fun bubbly brings the brut. It's Sahara dry, with a strong earthy and yeasty streak running through it. 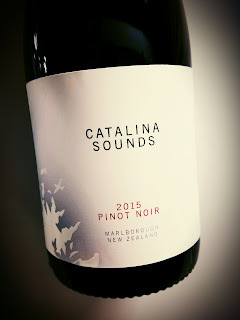 The unusual grape - Trepat - comes on with some of the earthiness of a North American variety, and provides a nice counterpoint to the Pinot Noir. It's my first time to taste Trepat, by the way, and I would do it again. Minerals all over the strawberry aromas and flavors hit very well, and provide food friendliness. Four Ferrari-Carano wines were recently featured in an online virtual tasting session, of which I was invited to be a part. The presentation was hosted by Chelsea Kurnick of McCue Communications and associate winemaker Rebecka Deike. She handles the winery's red wine program and started out wanting to be an optometrist, but she saw her focus change to a wine career. You may be able to find some of the online comments at #FCHolidayWine. One of the first dessert wines I ever tasted was a Black Muscat. It was a revelation, an epiphany, the dawn of a new day. Without overselling the moment, I very much enjoyed it. Since then I've reveled in each sweetie that came my way, although they have remained an addition to my wine interests, not a replacement. Even the good dessert wines, like Sauternes, can get to be a bit much if you concentrate on them at the expense of everything else. This is a dessert wine made from Black Muscat grapes that were grown in the Russian River Valley. The wine underwent malolactic fermentation, which tends to impart a creaminess by converting one type of acid to another. There was seven months cave aging in older barrels. Tasters online liked the idea of pairing it with bread pudding or triple chocolate cake. One wanted a well-marbled rib eye. The wine’s alcohol is a very reasonable 12.4% abv, while the residual sugar is 12.7%. This is one amazing dessert wine, possibly one for people who say they don't like dessert wines. The nose is deep and dark, just like the color, and smells like sugary tar with a black licorice backbeat. The sweetness is perfectly counterbalanced by the savory side. On the palate, it's all black currant and berries, with a streak of earth right down the middle. The tannins are medium firm and the acidity is somewhat low, so it's really sippable, but it also pairs well with soft cheese or a fruit dish. In St. Helena, 1,800 feet up Napa Valley's Spring Mountain, Charles and Stuart Smith started Smith-Madrone Winery more than four decades ago, when there was still room at the top in the "pioneer" field. 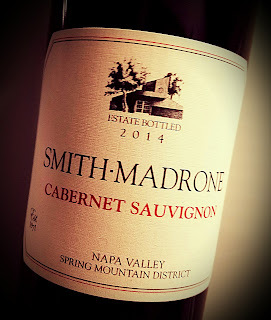 The outfit's name is a tip of the winemaker's hat to the Smith brothers, and to the madrone trees that populate the property. The 2014 vintage was marked by a horribly dry winter - they got only half their usual rain - and an earthquake. The 42-year-old, dry-farmed Cabernet Sauvignon vines held their own, though, and yielded an abundant crop. It's all estate fruit from Napa's Spring Mountain District here, 85% Cabernet Sauvignon, 8% Cabernet Franc and 7% Merlot. 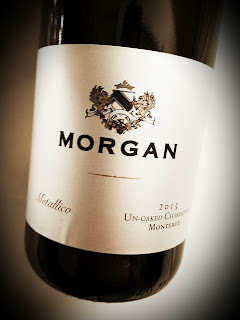 The wine spent 18 months in French oak barrels, 70% of which were new. Alcohol hits only 13.9% abv, which is uncharacteristically low for a red California wine. 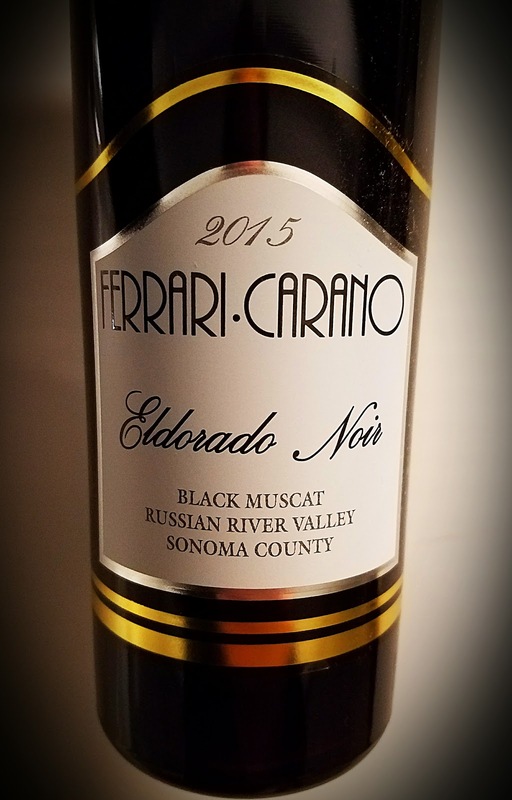 This wine retails for $52, a relative bargain in the world of Napa Cabs. Nearly 2,000 cases were produced. The medium-dark wine really has a powerful nose, or maybe I should say an "expressive" one, since elegance wins over power. The dark fruit is draped in earth and minerals and some of the more lovely holiday spice and pencil-lead notes that I've run across lately. On the palate, the fruit tastes "grown up" instead of candied - savory instead of sweet. The tannic structure is firm yet fanciful, the mouthfeel flinty yet filigree. The wine will pair wonderfully with a steak or a pork chop, but it's a great sipper, too. Morgan Winery is a Salinas outfit with vineyards in the Santa Lucia Highlands of Monterey County. The winery's location makes me think of Steinbeck, but the wine makes me think of the Rhône Valley with a splash of Spain. Dan Morgan Lee was making wine from other people's grapes in the 1980s, and bought the winery's Double L Estate - for double luck, twin daughters - in the 1990s. The ink wasn't even dry then on the Santa Lucia Highlands AVA papers. The vineyard is certified organic by Monterey County Certified Organic, and it's certified sustainable as well. Winemaker Sam Smith used grapes from from northern and central Monterey County to create the 2017 G 17 Syrah. It's one of those only-in-America blends featuring two Rhône grape varieties and one from Spain, all grown in Monterey County, of course. The mix is 87% Syrah, 9% Grenache and 4% Tempranillo. G 17 was aged for 15 months in French oak barrels, a quarter of which were new. The grapes came primarily from the Santa Lucia Highlands and Arroyo Seco Appellations of Monterey County. The first whiffs of this medium dark ruby wine are pretty boozy, but they're loaded with black berries, tobacco, smoke, leather and spices. The palate picks up black cherry and a ladle of cinnamon, allspice and nutmeg. The wine drinks surprisingly gently, with enough tannic structure for roast or pork. A medium finish is noteworthy and is missed when it fades away. Denizens of the desert will have a new reason to celebrate in a culinary way. The Rancho Mirage Wine and Food Festival will happen on February 17, 2018 at the Rancho Mirage Amphitheater and Community Park. Attendees will be able to revel in more than 200 handcrafted wines and cuisine from 15 of the area's top chefs. The event is put on by David Fraschetti, a full time resident of Rancho Mirage and the creator of the VinDiego Wine and Food Festival held in San Diego each April. I'll be there, and not just because they're giving me tickets. Find them and follow on Twitter @rmwineandfoodfest for the #RMWineFest2018. Wineries from California and Washington State will be showing their stuff, with Justin and Navarro among those planning to pour. The wines are enough to get me there, but they'll also have some of the top chefs in the desert offering culinary experiences from restaurants like Acqua California Bistro, Blue Ember and Haus of Poke. 16 of Rancho MIrage's best Chefs will compete for the title of "Chef of the Fest." Guests can also enjoy a steady stream of live music throughout the event. The Rancho Mirage Wine and Food Festival will also support local charities with 100% of Silent Auction proceeds going to the Desert AIDS Project. Old vines are appreciated the most in Zinfandel vineyards. California's heritage grape has been growing nonstop in Lodi for more than a century, and the older the vines are, the more character the wine has. It's what makes Zinfandel a popular favorite in the Golden State. Besides, how you gonna keep 'em drinking Merlot once they've had a taste of old vine Zin? 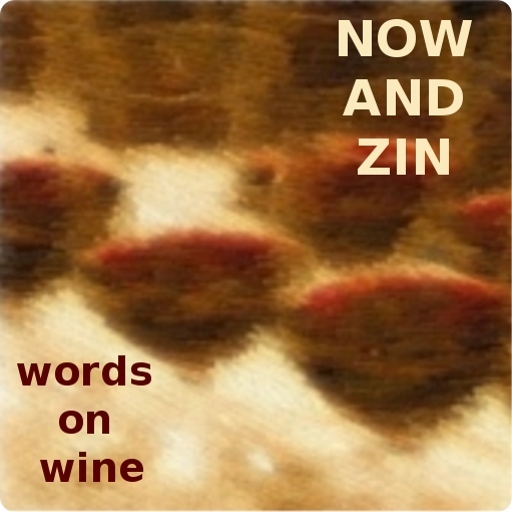 A recent virtual tasting of old vine Zinfandel wines from the Lodi region featured three people who are delightfully nerdy (watch) and incredibly passionate about their Zinfandel. The online session was held on National Zinfandel Day and led by Stuart Spencer, of St. Amant Winery and the Lodi Winegrape Association. He was joined by Kyle Lerner of Harney Lane Winery and Kevin Phillips of Michael-David Vineyards. They focus on Zinfandel with a love not just of the grapes and the wine, but of the character and history of the vineyards and those who planted them so long ago. Lerner says Zinfandel is "all about the fruit," so it’s okay that his wines sell out before they're quite ready. Age them if you want to, or enjoy them now. The grapes for the Harney Lane Old Vine Zinfandel 2014 came from the Lizzie James Vineyard, a plot of grapevines that was planted in 1904. The wine is a dry-as-a-bone award-winner that spent 21 months aging in French oak barrels and hits a heady 15.7% abv. It retails for $36. This Zinfandel, from vines planted in 1904, is forest-dark with brambly, black fruit and tons of supporting characters. The nose emits all that you may dream would accompany a wine made from 114-year-old vines. There is spice, there is tobacco, there is tar; cinnamon, mocha. Leather, dirt and oil also appear. The palate is similarly dark, but surprisingly youthful and perfumed. The acidity rips, the tannins roar and the wine does its duty on marbled beef.